To mark the 85th birthday of Arnulf Rainer (b. 1929 in Baden near Vienna), one of Austria’s foremost contemporary artists, Galerie m Bochum is presenting a show of works by the artist from April 24 to June 13, 2015. Among the most influential painters of the present day, Rainer rose to international fame early on, with solo exhibitions at major museums such as the Centre Pompidou in Paris and the Guggenheim Museum in New York. The current exhibition is Rainer’s 10th solo show at Galerie m in the space of 35 years. On view are an early black overpainting, photobooth portraits and examples from the work groups “Fingermalereien,” (Finger Paintings) “Christusübermalungen” (Overpaintings of Christ Images) and “Animalia,” as well as pictures from the 1990s. 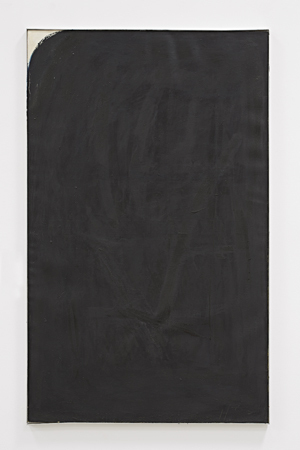 The exhibition features a now-rare black overpainting from around 1958. In the 1950s, Rainer began to rework his earlier paintings, developing them further and overpainting them. Soon he extended this prolonged work process, involving several steps, to works by other artists, as well as to photographs and reproductions. In search of “contemplative tranquility” – as he puts it – he arrived at monochromatic colored surfaces nearly covering the entire canvas. “The very dark image, full of an overwhelming silence, is to me ideal.” (Rainer) In the 1970s a phase of intense engagement with photobooth portraits is followed by an interest in finger painting. The exhibited “Fingermalerei, schwarz” from 1977/94 demonstrates the intuitive creation process and the physical and emotional involvement of the artist. Equally expressive are the later paintings “Holzwege (nach Heidegger)” (Off the Beaten Track [after Heidegger], 1994) and “Wasserfall” (Waterfall, 1995) whose dense layers of paint bear the marks of repeated overworking, reminiscent of injuries and scars. 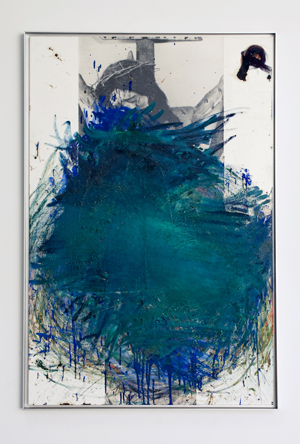 Overpaintings of Christ images became an important theme for the artist in the 1980s. With his powerful adaptations of reproductions of historical representations of Christ, Rainer heightened their ability to convey suffering. In an attempt to overcome a personal trauma experienced upon encountering a black adder, the artist then took up 19th-century scientific illustrations of snakes. The work group "Animalia" comprises a number of modified animal images, the overpainting serving to enhance their dramatic effect. The exhibits on view document Rainer’s constant quest for new directions in painting and attest to his direct and intense confrontation with the representational potential of the painted surface.